Holder: Vote to hold me in contempt "unwarranted"
(CBS News) Attorney General Eric Holder on Thursday called "unwarranted, unnecessary, and unprecedented" a vote by the House Oversight and Government Reform Committee to hold him in contempt of Congress for failing to turn over documents pertaining to Operation Fast and Furious. A year-and-a-half long investigation into the botched gun trafficking program culminated Wednesday with the committee's vote along party lines to pass a resolution holding the attorney general in contempt. The vote went forward despite intervention by President Obama, who invoked executive privilege, which protects the Justice Department from handing over documents, even though a subpoena has been issued. For Holder to be held in contempt, the full House of Representatives must approve the committee's resolution. According to House Speaker John Boehner, R-Ohio, and House Majority Leader Eric Cantor, R-Va., the vote will take place next week. Watch Holder's comments in the video to the left. "We put before the committee a proposal that would have allowed for a resolution of that matter, consistent with the way these have been resolved in the past through negotiation," Holder said Thursday following a meeting in Copenhagen with European Union justice officials. "I think the possibility exists that it can happen in that way - the proposal we have made is still there." In a statement, Republican leaders clung to their requisite that Holder produce the documents in order to avoid contempt: "While we had hoped it would not come to this, unless the Attorney General reevaluates his choice and supplies the promised documents, the House will vote to hold him in contempt next week," they said. "If, however, Attorney General Holder produces these documents prior to the scheduled vote, we will give the Oversight Committee an opportunity to review in hopes of resolving this issue." Watch a CBS News special report in the video to the left. If the House backs the panel's actions, punishment could be hard to hand down. A 2007 Congressional Research Service report notes if "information is protected under executive privilege, past practice suggests that the Department of Justice will not pursue a prosecution." At issue are documents over the Arizona gunwalking program that put guns in the hands of illicit gun purchasers as a way to track Mexican smuggling cartels. As a result of the program, hundreds of guns showed up in Mexico and one was found where a U.S. border agent was killed. Issa and his counterpart in the Senate, Charles Grassley, R-Iowa., opened an investigation into the case more than a year ago. 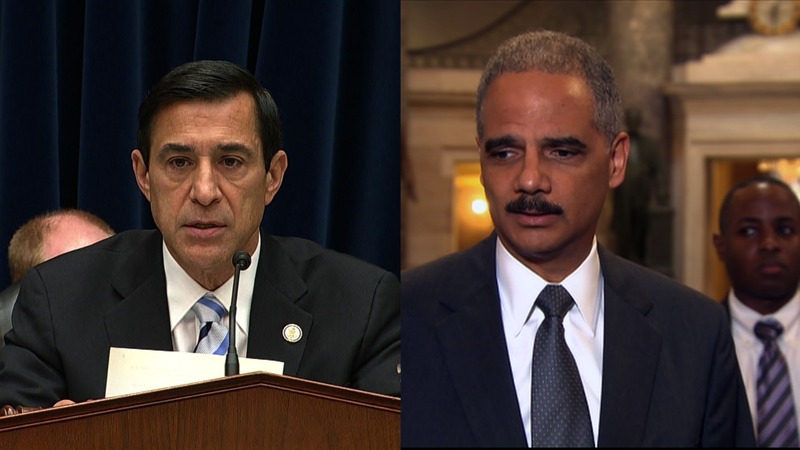 An attempt to diffuse the standoff failed Tuesday after Rep. Issa and Holder were unable to reach an agreement regarding Justice Department documents on the program between February and December of 2011. "We're not looking to hold people responsible. We're looking for document production," Issa said Tuesday. Holder said he has provided more than 7,500 pages of documents and that on Tuesday he made Issa an "extraordinary" offer that includes documents, a briefing on those documents and answers to questions Issa and his committee might have. Watch Issa's comments after hearing in video to the left. The contempt proceeding has elevated the face-off between the executive and legislative branches, which has led to the White House becoming involved by asserting executive privilege. In a letter to President Obama asking for executive privilege, the attorney general wrote "that the Committee has not established that privileged documents are demonstrably critical to the responsible fulfillment of the Committee's legitimate legislative functions." A White House aide told CBS News that this is the first time President Obama has asserted executive privilege, and noted that President George W. Bush used the privilege six times and President Bill Clinton used it 14 times. With the White House's move, House Speaker John Boehner, R-Ohio, raised the prospect that the Obama administration was involved in Fast and Furious. "Until now, everyone believed that the decisions regarding Fast and Furious were confined to the Department of Justice. The White House decision to invoke executive privilege implies that White House officials were either involved in the 'Fast and Furious' operation or the cover-up that followed. The Administration has always insisted that wasn't the case. Were they lying, or are they now bending the law to hide the truth?" Boehner spokesperson Michael Steel wrote in a statement. However, Rep. Elijah Cummings, D-Md., top Democrat on the House Oversight Committee defended the president's assertion of executive privilege. "In this case, it seems clear that the Administration was forced into this position by the Committee's unreasonable insistence on pressing forward with contempt despite the Attorney General's good faith offer," Rep. Cummings said at Wednesday's contempt proceedings.